It's been a little while since I've done one of these...but I HAVE been Pinning like crazy! :) So here's some of my faves from around the web this week. 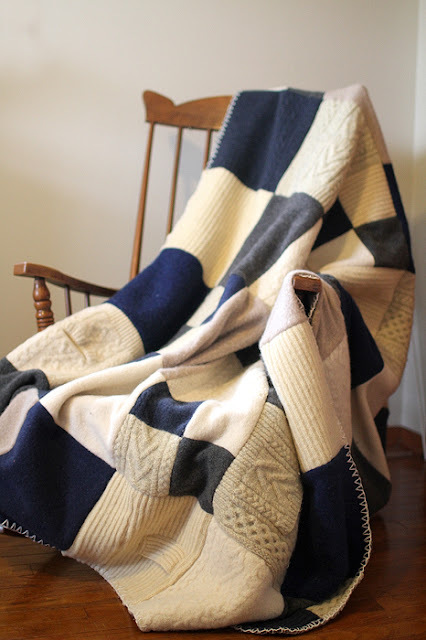 This blanket is just jaw-dropping! I want to make a smaller one for my friend's baby (I have a few months still), the best part? She made it from thrifted jumpers! The tutorial is so great, lots of step by steps and pretty pictures. These cupcakes from i(heart)2stamp not only look delicious, but they look beautiful too! And they're easy to make too! :) Instructions here. This garland is perfect for valentines or for a little girl's room (or a craft room if you're that lucky!). The step by step is here. I lovelovelove this idea. Magnets inside odd socks to make a fishing game! I can never throw ours out just in case! The perfect solution! And finally, I found this picture which made me sigh with relief!